18 Mar 2018 – The thirteenth edition of the World Social Forum came to an end on Saturday (March 17), attracting more than 60,000 people to the various activities and debates held during the five-day event. The main venue was on the campus of the Federal University of Bahia (UFBA), in Ondina, but other spaces of the Bahia capital held activities as well, including the Exhibition Park, the Isba Theater and the Pituaçu stadium.. The tone to the Forum was set by discussions of democratization of communication, financial system, work, education and youth, future of work, science and technology, employment and income, rights for migrants and refugees, national sovereignty and science and technology. “This is my first forum and the debates have been very rich and complementary and show the importance of our struggles and confrontations against the advance of neoliberalism,” says Chilean student Maribel Diaz. A democratic and collective space between social organizations; the World Social Forum was also the opportunity for many families to earn extra money and support themselves. This is the case of Maria Andrezina, an artisan from Tocantins. She traveled a distance of more than 1500 km in three days of travel to expose and sell the crafts she makes from golden straw. This craft has been developed by her family for generations and is their only source of income. “With the money from the sales I can pay the bills and kept the expenses of the house. The Forum is an excellent opportunity,” she says. Ensuring income is also one of the goals of Thais Maciel, member of a collective of mothers. Born in Brasilia, Thais traveled to Brazil with her son Davi, who is one year and six months old along with other mothers to sell their crafts. “I have traveled this country and David has been with me for two months. With the sale of these crafts I keep my expenses and his expenses. That’s what matters to me. I do not want to get rich, I want to support my family and participate in moments like this,” she says. Products of family agriculture, clothing, and ecological bed, table and bath items were also found throughout the Federal University Campus, supporting an economy of solidarity. The Future of Labor was a priority theme in the CUT Tent during the five days of the World Social Forum. In this year’s edition, the themes and priorities of the CUT were: 1) democracy and work, 2) the future of work, 3) food production / food sovereignty; and, 4) migrations. The activities brought together hundreds of participants from different categories in the two Tents (Margarina and Chico). For these activities held at the tent, CUT brought special guests such as; Márcio Porchman, of the Perseu Abramo Foundation; João Felício, from CSI; Vitor Baez, from CSA; the ambassador Celso Amorim, former minister of Foreign Affairs; and Valter Sanches, of Industrial, among others. The participation of the trade unions was decisive for the success of the 2018 World Social Forum in Bahia. With their flags of struggle and thematic in defense of the workers of Bahia and Brazil, the unions contributed to the construction of a better world. Throughout the 5 days of debates more than 100 activities were registered and debated in the Tent for the Future of Work. Recognition, unity and commitment to workers sum up the participation of trade unions. For the first time in the history of the World Social Forum, a special space was reserved for children, the Forinho. While David’s mother sold handicrafts, he joined the Forinho, along with other children. The Children’s Forum amused the children with games and recreational activities. “While I’m in the debates, in the fight, she’s having fun,” says David’s mother. National artists such as Tulipa Ruiz, Ilê Aiyê and Ana Cañas participated in the World Social Forum. Ana Cañas from São Paulo participated in the World Assembly of Democracies, held in the Pituaçu stadium with the participation of several development leaders such as former President Lula and former Honduran leader Manuel Zelaya, and paid tribute to councilor Marielle Franco of PSOL, who was assassinated in Rio de Janeiro on the night of last Wednesday (March 15). At the same event, the Afro bloc Ilê Aiyê made a presentation, highlighting black culture and rejecting racism and all forms of prejudice. The singer Tulipa Ruiz gave a presentation to the youths who were camped in the Parque de Exposições. The high point of the Forum took place on Thursday and included the participation of former President Lula, former President Dilma Rousseff and former Honduran leader Manuel Zelaya. The president was acclaimed in the event of Launching of the Committee of International Solidarity in Defense of Lula and the Democracy in Brazil, realized in the tent for Future Work. The Committee aims to develop worldwide support to overturn the coup and system of repression that has been established in Brazil. Organized by the Central Única dos Trabalhadores and the Perseu Abramo Foundation, the launch of the Committee was also attended by the ambassador and former defense minister, Celso Amorim, and Professor of the University of Coimbra, Portugal, Boaventura de Sousa Santos. That night was the most awaited moment of all the programming and was also the one of greater adhesion. 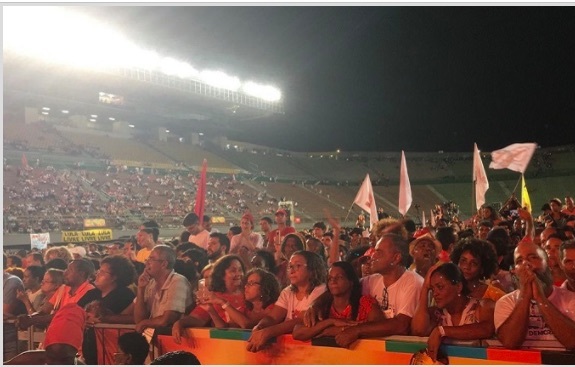 Thousands of people gathered at the Pituaçu Stadium to attend the World Assembly in Defense of Democracies and to see closely the great exponents of left-wing movements and parties. The most eagerly awaited guest was former President Lula, but the audience was also thrilled to be moved and to imagine a better future for our country with speeches by the governor of Bahia Rui Costa, Senator Gleisi Hoffman, federal deputy and presidential candidate Manuela D ‘Ávila, former president of Honduras, Manuel Zelaya, as well as trade union leaders and representatives of social movements and students. All were united to struggle for the preservation of the democratic state of right that has been constantly threatened by the coup government of Michel Temer. During the Assembly of Women held in Pelourinho, the women approved a document that expresses their indignation at the situation to which they are submitted. The document proposes ways to defend women around the world. dismantling of the patriarchal structure of the media. The women spoke out against racism, xenophobia, genocide and all forms of discrimination; against capitalism, colonialism and imperialism that exploits and expropriates women all over the planet. The women approved a motion of repudiation for the death of councilwoman Marielle Franco and another one of solidarity with the struggle of the women of Venezuela. At the end of the Assembly, the participants left in a march to the Town Square with the sound of the Didá Band of the Terreiro de Jesus. As of today (March 17), a new phase of social and political confrontations is on the scene for hundreds of young people in the country. The Intercontinental Youth Camp brought together young people from all over the country to talk about politics and youth rights in Brazil and in the world. It was three days of debates, integration and lots of fun for the young people at the Parque de Exposições in Salvador. On the morning of the last day (March 17), the results of various activities were presented. The last day of the World Social Forum reserved an important moment of convergence among the 19 axes of discussion that were part of the event. Members from various parts of the world have transformed the UFBA Central Library into the “Agora of the Futures”, a space destined to expose actions that will keep alive the flame of knowledge that was created during the 13th edition of the World Social Forum in Salvador. More than 60 thousand people from 120 countries took part in the activities and 1500 collectives, organizations and entities were registered. Some 1400 self-organized activities were carried out with the participation of representatives from countries around the world, such as Canada, Morocco, Finland, France, Germany, Tunisia, Guinea, Senegal and Central America.